We have a showroom showcasing all the features built in appliances have to offer, here’s some useful hints and advice to help you. flexibility to be positioned in a variety of ways. For example underneath a work unit, in a row with similar single ovens, or fitted above or underneath a built in microwave. oven cavities into a kitchen without losing handy work top space. Built In Double Ovens – We find Built in double ovens are popular as they provide two large oven cavities at an ideal height for the cook. They’re fitted into a tower unit so you can conveniently check the progress of a dish at eye level height. You’ll discover there’s a large range of hoods available in different styles, sizes and power options. The main purpose of a cooker hood is to banish the cooking odours and grease from the kitchen. For maximum performance we always recommend they should be vented to an outside wall so cooking odours are removed from your home. However, if this isn’t possible we offer alternatives using internal filters, these are very effective but can be expensive to maintain. Do you need a four or five burner gas hob? Would you like automatic ignition? Will you need cast iron pan supports? Induction hobs – these can save you a third of your time and energy bills. Halogen hobs are as quick as induction but can be more expensive to run. Ceramic hobs are popular as they can be used with more pan types. We find customers like these because they can free up valuable worktop space in the kitchen. We install them with the addition of a built in kit that comes as standard. We offer a range of built in dishwashers in two standard widths, 60cm or 45cm. You can choose a Fully Integrated option where the full dishwasher is covered by the kitchen panel, or a Semi Integrated version where the door is covered by the kitchen panel but the control panel is visible. We offer the choice of having your built in fridge installed either in a tower unit known as an in column fridge or underneath a work top known as a built under fridge. We offer a choice to suit your particular requirements, either a 50/50 split or a 70/30 split. Both options are available as no frost or frost free. 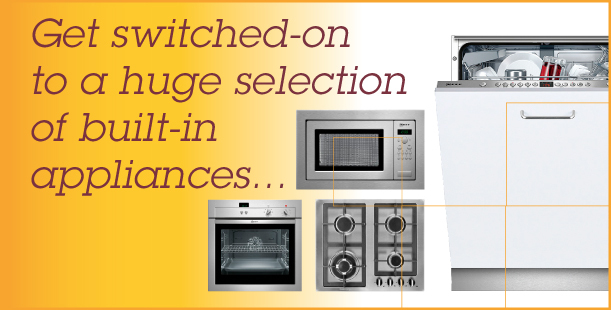 We stock a selection of appliances with three drum capacity options (5, 6 or 7kg) so you can choose the right one for your needs. A key consideration here is that unlike free standing tumble dryers, built in versions are only available as a vented option. As with washing machines, we offer three drum capacity options – 5, 6,7kg. One important tip is that it’s always advisable to take out half the load when drying to prevent overloading the motor. We can only touch on a few of the many buying considerations here so we’d recommend you call us or visit our Showroom for more detailed advice on any of the appliances in this section – remember, we’re always happy to help!